One of the most popular excuses given for not exercising is that “it’s boring.” While that statement has been debatable all along, it’s being eradicated recently. With adventure events popping up all across the globe, “boring” and “exercise” will never be in the same sentence again. The Color Run is a prime example of how people are adding a little color to their exercise routine, literally. The Color Run is a booming event that is truly like no other. 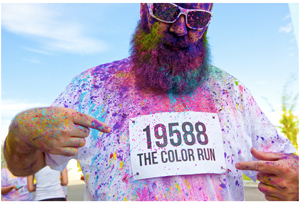 The event is simply stated in its name, a run with color. The run is on a three mile course designed for all abilities, shapes, and sizes, making it perfect for someone’s first 5K race. Participants are only instructed to do a few things: Line up at the start with a white shirt and plan to be doused in color by the finish. Needless to say this race is intended to be fun with a side effect of exercise. 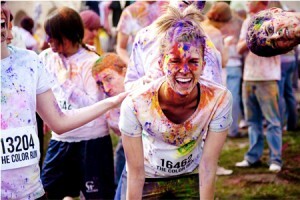 Runners finish a colorful mess and then proceed to have a post-party with bands, food, and many other colorful activities. This year’s events, “The 2019 Tour de Color Run,” are taking place in more than 30 cities nationwide. The events are filling quickly as so many are wanting to get in on the colorful fun. Most registration fees range from $40-$50 dollars, depending on individual or team sign-up. Each individual event chooses the charity they want the race to benefit. Some events are sponsoring Ronald McDonald House charities, others are contributing to Habitat for Humanity, while others are staying local and benefiting park organizations. Each race has a worthy cause you can help them support! If you look at just a few pictures from previous events, it’s clear that these people are having a blast while they just happen to be exercising. There’s no room for boredom at The Color Run! We thought it looked like so much fun, our Wichita-based DietsInReview.com team signed up for the Tulsa event, June 23. We’ll see you out there. May the most colorful win!